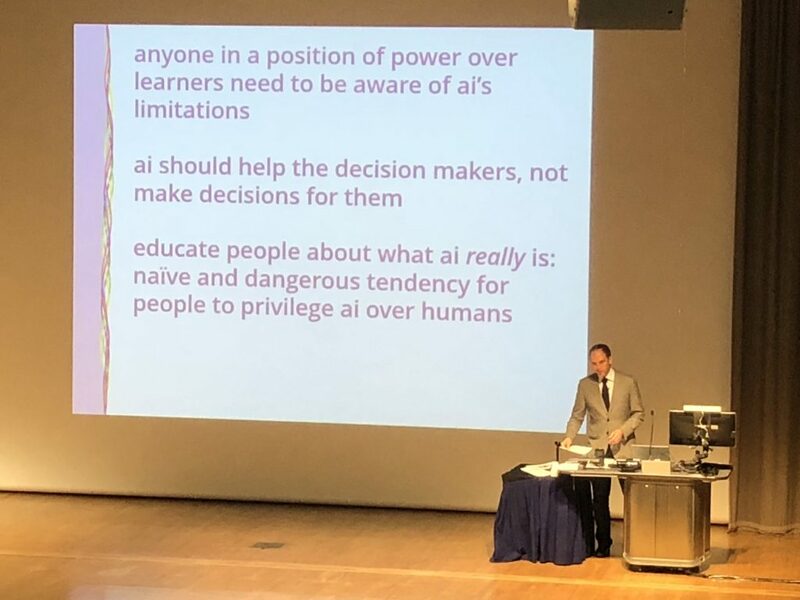 I attended the London Festival of Learning this year from June 22nd-30th, which brought together three conferences: the 13th International Conference of the Learning Sciences (ICLS), the Fifth Annual ACM Conference on Learning at Scale (L@S) and the 19th International Conference on Artificial Intelligence in Education (AIED). It was great to see the convergence of ideas and academics from these three fields that generally work towards enhancing educational practices with technology. I could see overlaps and similarities in the topics of research being studied by these communities, but I also noticed they were divergent in terms of the main foci of their research. The festival was huge with over a 1000 attendees, and also involved edtech companies that wanted to develop evidence-informed products. Throughout the conferences, I found an emphasis and move towards making more use of human ability and intelligence to augment what artificial intelligence can do for education in many keynotes and talks. 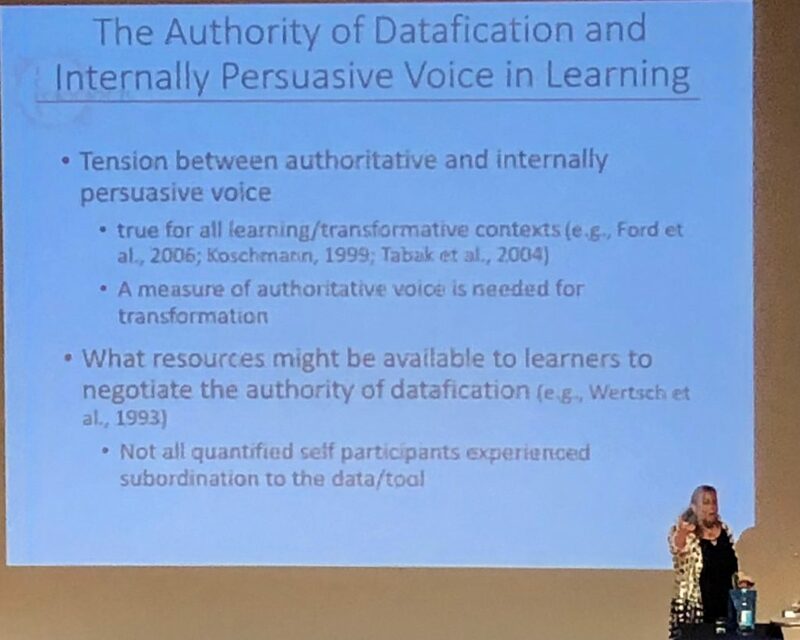 This included concepts like giving importance to our internally persuasive voice and the power of negotiation in addition to “datafied” learning, and embracing imperfections from machines by adding in human context. A critical stance on what Artificial Intelligence can and cannot do was seen, with more conversations happening around the ethical use of learner’s data. In the sessions, I could see a lot of research on developing intelligent tutoring systems, agents, intervention designs and adaptive learning systems for teaching specific skills, and advances made in their techniques. The majority of data comes from online settings i.e, students’ trace data from their usage with such systems. Recently, multi-modal data is getting more attention where sensors and wearables collect data from learner’s physical spaces as well. One best paper award winning work on Teacher-AI hybrid systems showcased the power of mixed-reality systems for real-time classroom orchestration. The cross-over session and the ALLIANCE best paper session showcased interesting research cutting across the three communities; it’s a shame we couldn’t attend both sessions since they ran in parallel. Simon Knight presented our work on Augmenting Formative Writing Assessment with Learning Analytics: A Design Abstraction Approach at the cross-over session where he explained how we can augment existing good practices with learning analytics, and use design representations for standardizing these learning designs. I presented our poster on studying the revision process in writing in AIED, where I used snapshots of students’ writing data to study their drafting process at certain time intervals. I also participated in the collaborative writing workshop earlier in ICLS where many interesting tools to support writing were discussed. I shared about AcaWriter – a writing analytics tool providing automated feedback on rhetorical moves, developed by the Connected Intelligence Centre, UTS which is now released open-source. Overall, it was a great place to learn, network and follow work from related disciplines (with some catching up to do on the presented work, coz we can only be at one place at one time during the parallel sessions). I did feel a bit exhausted a the end of it (maybe I’m better off attending one conference at a time 🙂 ), but I guess that’s natural, and you can’t complain when your brain gets so much to learn in a week! I started off with a Writing Analytics workshop, which we organized in Day 1 of LAK. We used a Jupyter notebook which runs Python code to demonstrate the application of text analysis for writing feedback and the pedagogic constructs behind designing such applications for learning analytics. Our aim was to bridge the gap between pedagogic contexts and the technical infrastructure (analytics) by crafting meaningful feedback for students on their writing, and to do so by developing writing analytics literacy. The participants were quite engaged in this hands on approach and we had good discussion on the implications of such Writing Analytics techniques. 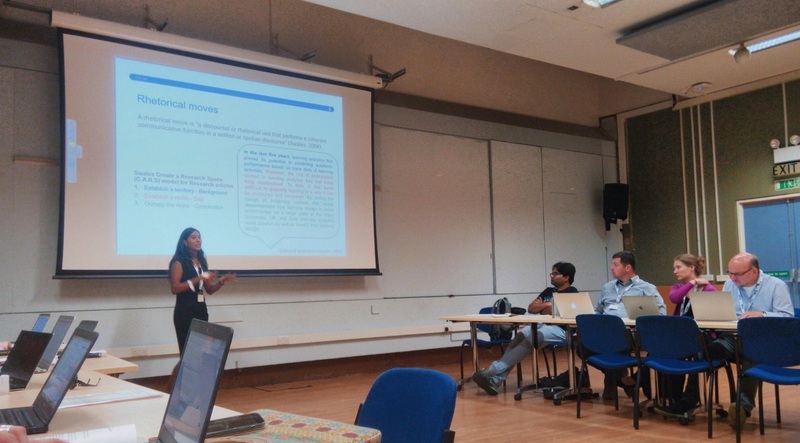 The new workshop for school practitioners was of interest to many educators working in K-12 learning analytics applications, and the Hackathon continues to be of wide interest. After the pre-conference events, the main conference officially started with the first keynote by Prof. David Williamson Shaffer on ‘The Importance of Meaning: Going Beyond Mixed Methods to Turn Big Data into Real Understanding’. David talked about how data is not scarce anymore, and to analyze such a sheer volume of data for learning, how we have to go beyond traditional quantitative and qualitative approaches. He gave examples of logical fallacies where statistics is likely to be misused while interpreting the concepts in learning, and introduced the notion of quantitative ethnography which can close the interpretive gap between the model and the data. In general, there was great interest in the development of theories around designing dashboards, discussing how to and how not to develop dashboards for students. The second day of the main conference (aptly on International women’s day) started with Prof. Christina Conati’s keynote on user adaptive visualizations, where she talked about adaptive interactions. She showed how visualizations can be personalized for users by building user models based on eye tracking features. Visualization in general was another key topic which gathered growing interest in the LAK community, along with other topics like Discourse analysis and Writing Analytics, many of them moving towards more near real-time applications. It was quite an eventful day ending with the conference banquet in a Sydney harbour cruise. 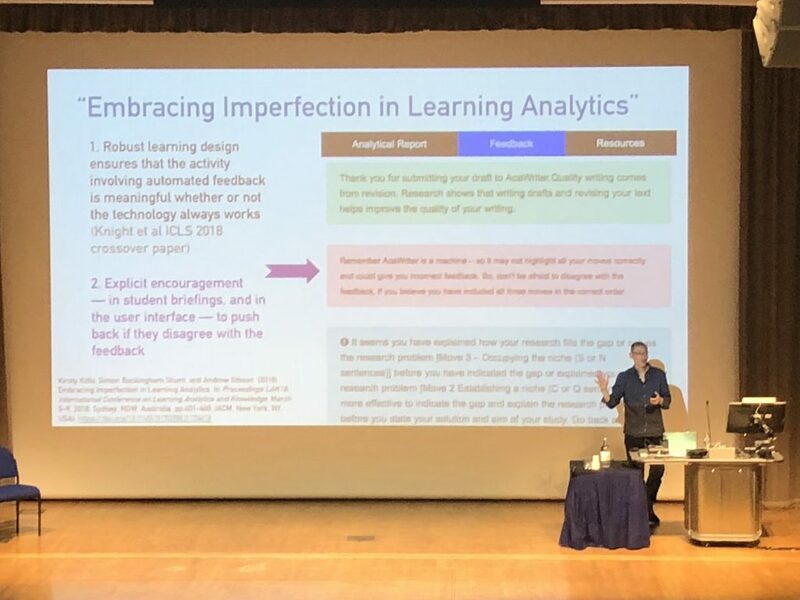 The final keynote on the last day touched upon a number of criticisms around learning analytics and how we can progress the field further taking into account the key aims of learning analytics. Multi modal learning analytics, MOOCS, Ethics and Policies, Theories, Self-regulated learning and Co-designing with stakeholders are other areas which continued to be discussed throughout the conference. And then to wrap it up, happy hour! Students at #LAK18, join the Graduate Student SIG for a post-conference happy hour. Celebrating the SIG's inaugural year, we'll provide libations, snacks, and information on SIG initiatives. To read all the interesting papers from LAK, follow this link.